Here are a dozen such questions that might have popped into your head, along with answers to each. Q. 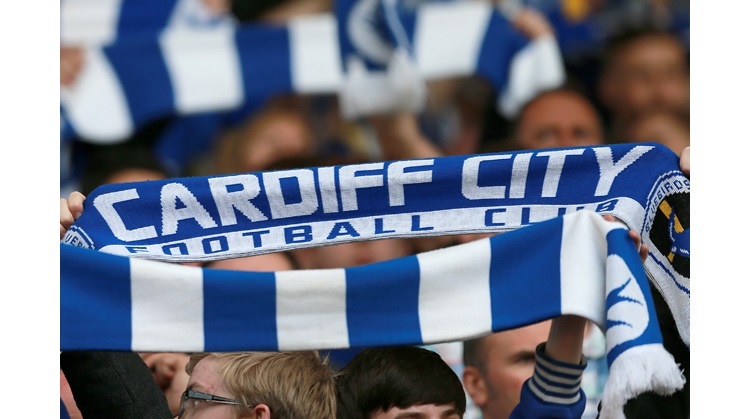 How have Cardiff City fared against Arsenal over the years? A. The two clubs have met 39 times, 30 of which were league matches. The clubs have played seven times in the FA Cup and twice in the League Cup. In league play, Arsenal have 11 wins and City eight. They have drawn the other 11. In the FA Cup, Arsenal have three wins and City two, to go with two draws. Arsenal have won both of the League Cup matches. Add everything up and of the 39 matches, Arsenal show 16 wins and City 10 with 13 draws. Q. When did Cardiff City last beat Arsenal? A. You've got to go back to February 11, 1961. City won at Highbury that day 3-2 with Graham Moore, Peter Donnelly, and Brian Walsh scoring for the Bluebirds. City moved up to 11th in the First Division table with the win that day. The win gave the Bluebirds the double over the Gunners too, as City had beaten the Londoners in Cardiff earlier in the campaign, 1-0 on September 24. Derek Tapscott got the game winner that day. The two clubs have met eight times since that February day in 1961, Arsenal winning four and the other four ending in draws. Q. City have two wins against Arsenal in the FA Cup. One was that famous 1-0 win in the final at Wembley on April 23, 1927. When was the other win? A. City beat Arsenal 1-0 in a second round game played at Ninian Park on February 2, 1924. Jimmy Gill netted the game winner. City got as far as the quarterfinals of the cup that year, losing a replay at home to Manchester City 1-0 after extra time. The two clubs had drawn 0-0 at Maine Road before 76,166 four days earlier. This was arguably City's greatest club as the Bluebirds went on to finish second in the top flight of the league that year. Q. Arsenal are the defending FA Cup champions. Have City ever drawn the holders in the cup before? Hotspur, in the quarterfinals of the 1921/22 competition. The clubs drew 1-1 in Cardiff before Spurs took the replay 2-1 in London. The Bluebirds met the 1926 winners, Bolton Wanderers, in the fifth round of the 1926/27 competition. City beat Bolton 2-0 at Burnden Park on the way to winning the cup themselves. The Bluebirds last met the holders in the cup when they faced off with 1979 cup champs Arsenal in the third round of the 1979/80 competition. Q. Have Cardiff City ever met Arsenal in the third round of the FA Cup before? A. This will be the fourth time Arsenal have drawn City in the third round. The clubs met in this round in 1954/55, in 1968/69, and in 1979/80. Arsenal advanced to the fourth round at City's expense in each of these three competitions. The Gunners beat City 1-0 at Highbury on January 8, 1955, but had to win replays to advance in 1969 and in 1980. In the 1968/69 competition, the clubs drew 0-0 at Ninian Park on January 4 before Arsenal won the replay 2-0 at Highbury three days later. In the 1979/80 third rounder, the clubs drew 0-0 in Cardiff on January 5 but the Gunners took the replay in London 2-1 three days after that. John Buchanan got City's goal in the replay and so is the last Bluebird to score against Arsenal in the FA Cup. Q. Has any other club drawn Arsenal as a third-round opponent more often than Cardiff City? A. Actually, no! Since the 1925/26 competition (the first year top-division clubs entered the cup in the third round), no other club has drawn Arsenal in the third round more often than Cardiff City. In fact, only one other club can match City's four third-round matchups - Stoke City. Stoke and the Gunners met in this round in 1928/29, 1956/57, 1989/90 and 2004/05. Arsenal advanced all four times they met Stoke. Needless to say, City will have to beat the Gunners on Saturday or in a replay at Ninian Park later this month to avoid the same fate. Q. How well have Arsenal done in third-round matches over the years? A. Altogether, Arsenal have advanced to the fourth round 56 times in 74 tries since top-division clubs first entered in the third round in the 1925/26 competition. That's a sparkling success rate of nearly 76%. Q. When did Arsenal last lose a third-round match? A. The Gunners have advanced to the fourth round in nine straight competitions. The last time Arsenal lost a third-round tie came back in the 1995/96 competition, when they dropped a replay to Sheffield United 1-0 at Bramall Lane after drawing 1-1 with the Blades at Highbury. They're 9-2-0 in 11 third-round games since then. Only two clubs have stopped the Gunners twice in this round - Chelsea and West Ham. The Gunners have been knocked out in the third round by some lesser lights, though, among them Bradford Park Avenue, Northampton Town, Rotherham, Walsall, and Wrexham. Q. How well have City done in third-round matches over the years? Arsenal's. In fact, it isn't gaudy at all. City have advanced to the fourth round only 24 times in 61 tries since top-division clubs first entered in the third round in the 1925/26 competition. That's a success rate of 39%. In the last 30 years, City have made 21 appearances in the third round and have advanced to the fourth round on seven occasions - in 1976, 1977, 1987, 1994, 1998, 1999 and 2002. That's a success rate of 33%. Q. How have City fared against top-division clubs in third-round matches? A. Cardiff have topped top-division opponents in the third round on seven occasions since World War II -- West Bromwich Albion in the 1949/50 competition, Leeds United in both 1956/57 and 1957/58, Sheffield United in 1971/72, Tottenham Hotspur in 1976/77, Middlesborough in 1993/94, and Leeds United again in 2001/02. In only one of those seasons, 1956/57, were the Bluebirds a top division club themselves. Q. How many of City's seven third-round wins against top-division clubs were road wins? A. City beat West Brom at the Hawthorns in the 1949/50 competition, topped Leeds at Elland Road in 1956/57 and in 1957/58, Sheffield United at Bramall Lane in 1971/72, and Middlesbrough at Ayresome Park in 1993/94. So, no less than five of the seven postwar wins against top-flight competition have come away from home. Q. What is City's all-time third-round record against top-division clubs? stands at 12 wins, 8 draws, and 18 losses.